It’s Gray Whale Season Along the Central California Coast! Every year thousands of gray whales embark on a grueling 10,000 mile migration, between their feeding grounds in Alaska and their calving grounds in Baja California. And although there’s no shortage of whale watching cruises along the Central California coast; it’s also possible to get a glimpse of these giant cetaceans from the shore. In fact, with a little patience and a keen eye, you can spot the migrating whales along the Central California coast as they head south in December and January, and again on their return journey in March and April. Not only is this option easy on the wallet, but in most cases it’s also much more accessible than a cruise. Of course, the key is knowing how and where to look for these massive mammals. First and foremost, whale watching takes a bit of patience. In other words, don’t expect to pop out of your car, scan the horizon, see a whale breach and then move on to the next location. That’s just not the way it works. In fact it’s not unusual to spend the whole afternoon at one site and never even catch a glimpse of a whale. Sometimes it’s all just a matter of being in the right place at the right time. That said, you can increase your chances of sighting a whale or two by bringing along a good pair of binoculars. It’s believed the whales use the shoreline as a navigation tool, and sometimes they are over two miles off the coast, and very difficult to spot with the naked eye. Carefully scan the water from left to right and back again, close to shore and across the horizon. There’s also a lot of debris in the water, so look for objects that move. If something just bobs up and down in one place it’s probably debris. It’s also a good idea to be on the lookout for boats, especially ones that are stopped, as they may be whale watching excursions. Indeed sometimes the best way to find whales is to find other people who are watching them. Finally, keep your eyes pealed for plumes of water, dorsal fins, and tail flukes, as these are sure signs of whale activity. And if you notice a big splash, that’s a sure indication that a whale has breached — or jumped out of the water. Keep scanning the water from right to left in the area of the breach, and you will most likely be treated to more whale sightings. Of course knowing what to look for is just half the battle; you also have to pick a reasonably good vantage point. With that in mind, here are a few of my favorite accessible whale watching spots along the Central California coast. Best of all, there’s no entrance fee to any of them! The Avila Beach Pier (www.avilabeachpier.com ) tops the list, and not just my list. This site has also been designated as a good choice by the folks at The Whale Trail (www.thewhaletrail.org) — an organization that identifies preeminent whale watching spots along the Pacific Coast. There’s accessible street parking on Front Street near the foot of the pier, and curb-cut access to a level sidewalk that leads over to the 1,685-foot long pier. A spotting scope and a Whale Trail sign are located near the accessible parking spot; however you have to be able to stand up to use the scope. Accessible restrooms are also located near the foot of the pier. Best of all, even if you can’t walk far, you can still get a good view of the ocean near the spotting scope. As an added bonus, there’s also an accessible pedestrian mall that runs along Front Street, where you can stop for a bite to eat or maybe even enjoy an adult beverage. Shamel Park (www.slocountyparks.org/day-use-parks/shamel-park) also makes a good vantage point for land-based whale watching. 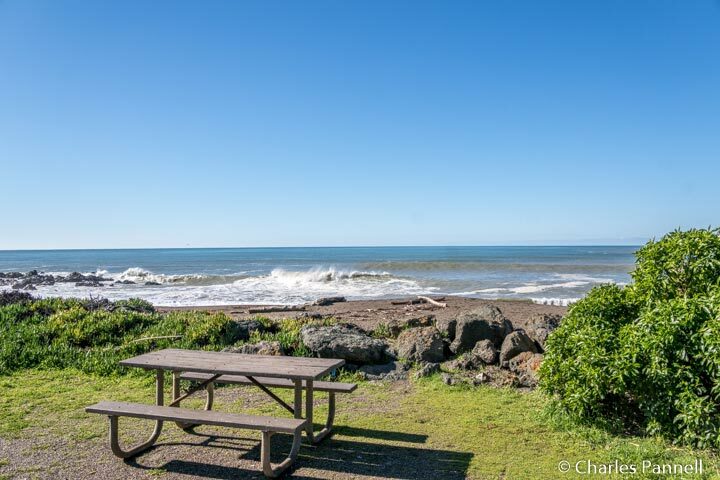 Located off Highway 1 in Cambria, it’s about a 45-minute drive from the Avila Beach Pier. Accessible parking is located near the park entrance, with level access to a slightly graded sidewalk that leads through the six-acre park. Accessible restrooms are located to the right of the main sidewalk, while a large picnic area on level ground is located to the left. At the end of the sidewalk, there are steps down to the beach, but if you bear left you’ll find an excellent whale watching vantage point. This site has several tables on level ground where you can get a great view of the Monterey Bay National Marine Sanctuary. Even if you don’t happen to spot any whales, it’s a nice spot for a picnic lunch. 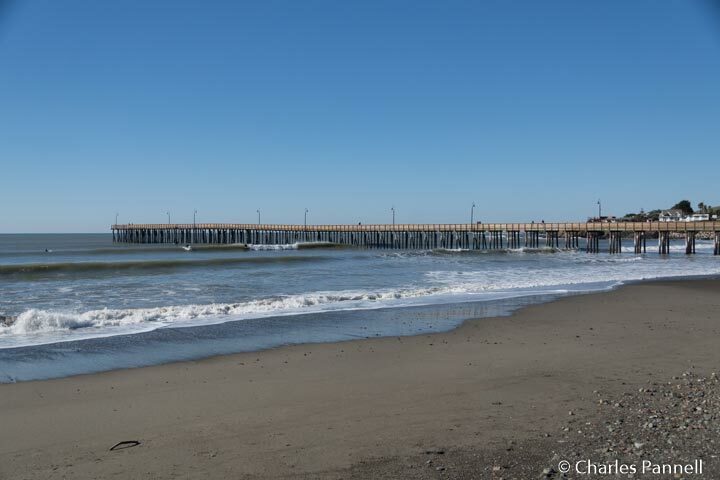 Last but not least, be sure and stop at the Cayucos Pier on your whale watching trek. 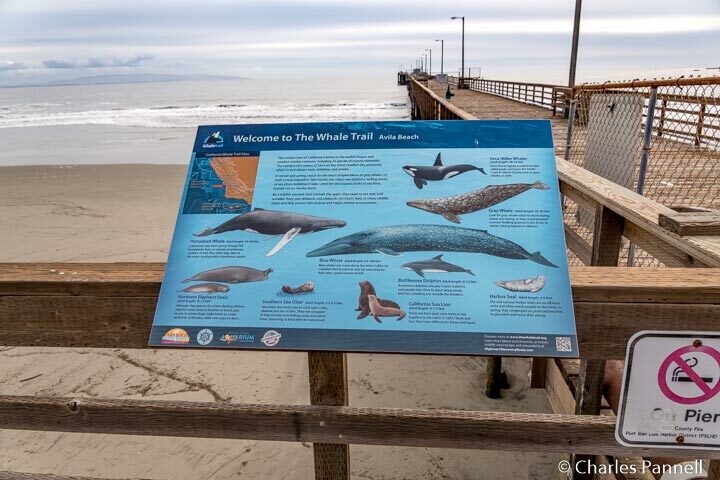 Located halfway between Cambria and Avila Beach, this pier is also a Whale Trail site. A dolphin statue marks the foot of the pier, and accessible street parking is located nearby. There’s level access to this historic pier, which was constructed in 1872 and renovated in 2015. Depending on your energy level you can either enjoy the small viewing platform near the beginning of the pier, or check out the view from the end of the pier. And if you’d like to fish while you whale watch, you’ll be happy to know that you don’t need a license for pier fishing. Even better, there’s level access to a mouth watering assortment of shore side restaurants near the pier. 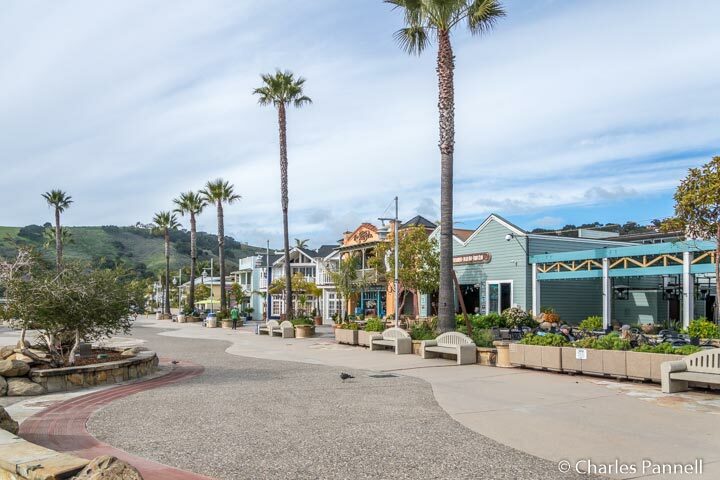 Dubbed “America’s Coolest Small Town”, Cambria is definitely worth a stop on any Central California Coast whale watching jaunt.